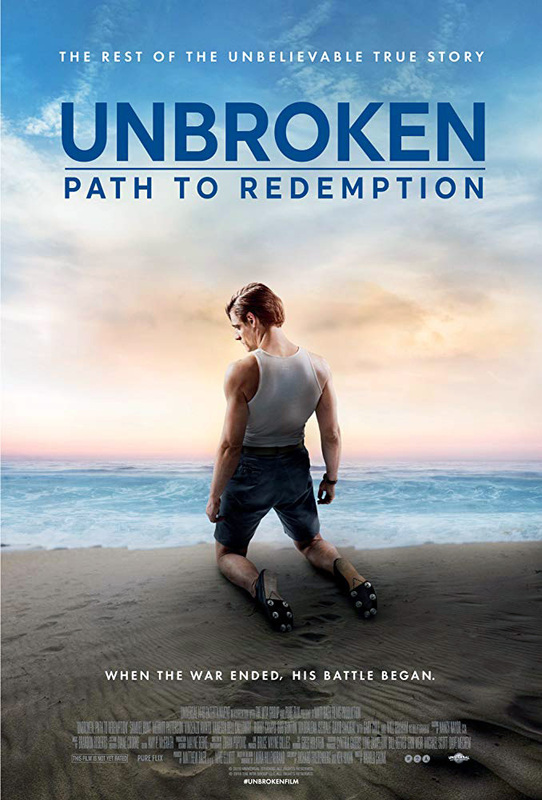 Why is "Unbroken: Path to Redemption" rated PG-13? The MPAA rating has been assigned for "thematic content and related disturbing images." The Kids-In-Mind.com evaluation includes some kissing, several scenes of war violence and nightmarish, repulsive visions. Read our parents' guide below for details on sexual content, violence & strong language. - A man and a woman dance closely together on a beach and kiss for several seconds. A man proposes to a woman and they hug and kiss; they visit a church and kiss in the aisle and the scene cuts to them coming out the front door after their wedding. A husband and his wife lie on a floor and kiss briefly. ► Several women on a beach wear 1940s type bikini tops that reveal cleavage and a narrow band of skin at the waist. A woman's long gown has a deeply cut neckline that reveals cleavage. A woman's nightgown reveals cleavage under her open robe. A few men are shown bare-chested. Two men wear swim trunks and open shirts that show bare chests and abdomens. - A man has several flashbacks and hallucinations: one night he dreams of water filling his bedroom and a shark appearing, and then sees himself in a life raft, sees a bowl of rice and maggots on the floor of a cell and a bowl full of maggots at a restaurant, and yells at and pushes the waiter as he leaves; he also has several visions of a Japanese POW camp leader with dirty gray teeth shouting at him in his room, in a newsreel, outside a church tent, and one time as he whispers "You are nothing" into his ear. A Japanese man is shown telling a veteran that he will destroy the vet and his wife. A flashback nightmare shows a shark swimming around water in the man's bedroom, and a Japanese soldier holding the man's head under water until the man awakens shouting. The man sees a flood in a parking lot and a shark, and then sees a Japanese soldier who seems to beat him in the stomach five times with a large wooden staff, making him fall while coughing and groaning; the scene cuts to the man lying passed out in his front yard. A man in an elevator relives crashing in his WWII plane and we see bullets ripping through the elevator car, the floor floods and we see the man on a life raft as he shouts and seems to fall into the ocean, where a Japanese soldier flails at him underwater and the scene ends. ► A man and a woman argue, and she slaps him away. A man and a woman shout at one another and she slaps him in the face hard, stating she wants a divorce. A man and woman shout, he throws her onto a bed, and throws her purse across the room. A man smashes a vinyl record. A man accidentally breaks a faucet that sprays water onto the kitchen floor. A woman drops groceries all over a staircase but retrieves them. ► A husband and his wife return from a restaurant and he is drunk so she tries to carry him to their door, he falls, gets up, enters the apartment and passes out on the couch. In two boxing gym scenes, a man punches a hanging bag several times as two other men punch at shadows and skip rope. ► A doctor's office features a display case with a huge hypodermic syringe. A man sketches pictures of a Japanese prison guard as a hairy demon (he later throws them away). A woman finds a photo of her husband and two other men, all severely underweight with ribs showing in sunken chests. A woman finds a handgun in a trunk. ► A man walks to an old prison camp in Tokyo and another man says, "These men did terrible things to you"; the two men enter a hangar to find dozens of Japanese men with dirty and some scarred faces sitting on the floor in rows and one man smiles and shakes hands with each of the other men. ► A man enters a bar and asks another man what he is going to do with a pistol; the second man admits that he is going to go to Tokyo to kill a Japanese war criminal, because the Japanese tortured him, gave him maggots for food, and injected him with garbage. A close-up of a headline states that a soldier is missing in action and bullets rip through the newspaper and an MIA certificate; we later hear that the soldier was declared dead but was found alive. A man tells a doctor that he refuses treatment for PTSD. A doctor tells a man he can have narcotic therapy to sleep 20 hours a day, hypnosis or shock therapy and the man turns down all three. A woman tells her husband that she is scared and that he needs a doctor. ► A woman finds red raw blisters on the soles of her husband's feet and bandages them. A man practices running on a track and falls, screaming when his ankle twists and breaks; the scene cuts to a medical room where we see a large break on an X-ray and a bandage on the man's lower leg, ankle, and foot; he later says that he feels God is tripping him up. ► A man attends a tent revival, fidgets, becomes tearful, and runs out of the tent during the closing prayer, pushing people aside; the preacher calls out the second time, "Don't leave!" and the man stops, sees a vision of a Japanese soldier shouting at him, says quietly, "No" and re-enters the tent where he falls on his knees. ► A man says that when he was rescued from a POW camp planes dropped chocolate bars and "It wasn't pretty" (diarrhea is implied). A man exits a washroom stall and we hear flushing. A man stumbles out of a bar and vomits yellow-white material over a car bumper. - Four untouched glasses of wine and a bottle are shown on a dinner table, a man drinks from a glass of wine and then drinks from a bottle while sitting in his car in the garage (another man takes his car keys), two beer bottles are shown by a grill at a cookout and two more bottles are on a table, tables in a hotel bar are shown with glasses of wine, men in a bar drink short glasses of whiskey and women drink wine and a martini, two men make a toast to a soldier who died in WWII, several men in a bar drink from bottles of beer, a man leaves a bar and drinks from a flask, a man drinks two shots of whiskey at a bar, a man drinks whiskey while giving a rambling speech and he staggers away, wobbling down a flight of stairs, a man tells another man to "Lay off the hooch," a man drinks ginger ale at a seaside bar and another man orders him an alcoholic drink that we do not see, a man drinks from a small whiskey bottle in his bathroom (he coughs and hides the bottle in the toilet tank), two men drink whiskey while seated on a couch, a man helps an inebriated man into a bar where we see a few men drinking whiskey from short glasses as another man drinks from a beer bottle, and a man pours five bottles of whiskey down his kitchen sink. - WWII veterans, torture, PTSD, flashbacks, Billy Graham Crusades, faith, loss, grief, unemployment, alcohol abuse, marriage, conflict, domestic violence, reconciliation, forgiveness, redemption, service to others, Japanese culture. - Forgiveness must be complete so pray for all your enemies.